FALL RIVER, Mass. — Southcoast Health today unveiled its state-of-the-art electrophysiology lab at Charlton Memorial Hospital in Fall River. The new facility expands and enhances Southcoast Health’s already nationally-recognized cardiovascular services program. The $4 million, 3,800-square-foot electrophysiology lab will be dedicated to performing complex ablations for patients with atrial fibrillation, ventricular tachycardia and atrial tachycardia. “With this state-of-the-art lab — utilizing advanced technology that is not found in most of the major Boston hospitals — we will be able to continue to provide outstanding outcomes for our patients but with less radiation and greater precision. 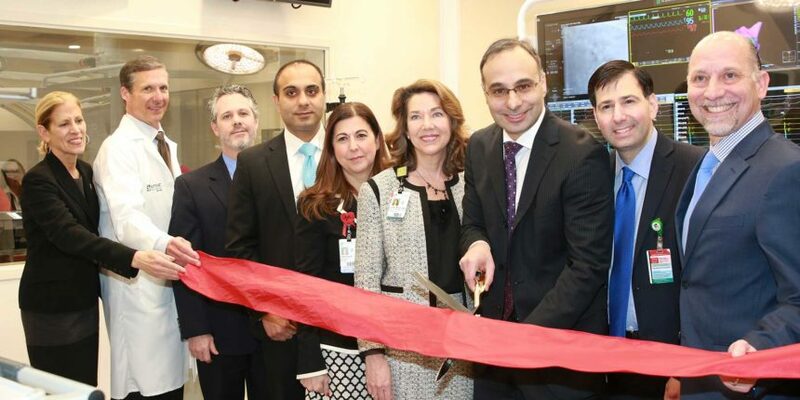 Better equipment will not be found anywhere else in this country or, for that matter, the world,” stated Dr. Ramin Davoudi, Director of Electrophysiology for Southcoast Health. The new electrophysiology lab, where providers will begin treating patients later this month, has more cameras to allow for better and quicker visualization of catheters. It uses highly advanced technology to minimize radiation from x-rays. In some cases, it can reduce x-ray exposure by up to 80 percent. It was designed by JACA Architects with Shawmut Design and Construction serving as general contractor. The lab also has a brand new mapping system that helps physicians localize abnormal electrical signals from the heart at 10 times the speed of the old system. This will cut down procedure times for the patient and the operator, and improve accuracy and success. This mapping system was recently approved by the FDA, and Southcoast Health is one of just 30 in the U.S. to utilize this technology. The addition of the lab will allow Southcoast Health to accommodate the increasing volume of patients and significantly decrease the wait time for many complex procedures. According to the CDC, an estimated 2.7 to 6.1 million people in the U.S. have A-Fib. In 2012, Southcoast Health discharged more than 700 A-Fib cases, the second highest number of all the commonwealth’s health systems. Healthgrades recently named Southcoast Health one of America’s 100 Best Hospitals for Cardiac Care — one of just four hospitals in Massachusetts to receive this distinction for six years in a row. Southcoast Health also received 13 additional recognitions for superior cardiovascular services, including Healthgrades’ Cardiac Care Excellence Award for the 11th straight year. “Achieving great results takes a team effort. It takes leadership — people who can envision great advances in care. Who know how to make that vision a reality, and who won’t take no for an answer. It takes great clinical expertise — physicians and nurses who have a passion for delivering excellent care. And it takes the community to get behind that vision and that passion, and to back it generously. We are fortunate to have all three at Southcoast Health,” said Jason M. Rua, Chair of the Southcoast Health Board of Trustees. The electrophysiology lab is housed in the multi-level, 6,700-square-foot Harold and Virginia Lash Heart and Vascular Center at Charlton Memorial Hospital, which is also the location of the hybrid operating room. The Lash Center was completed in October 2015 at a cost of approximately $14 million. Southcoast Health is currently conducting a major capital campaign in support of the new facility. The construction to date has been made possible made possible in large part by the support of individuals, businesses and organizations in the greater community, including leadership gifts from the Harold G. Lash Trust and the Manton Foundation. For more information about Southcoast Health’s cardiovascular services, visit www.southcoast.org/heart.